We were slipping on the icy sidewalk as we got into the pre-dawn taxi in Toronto that took us to the airport. Sixteen hours later we stepped off the airplane in St. Georges, Grenada and were blasted with 92 degrees F humid air. We spent the next week getting Pilgrim ready for launch, including applying two coats of bottom paint below the waterline. Pilgrim had more water damage than we had anticipated. Water managed to get into the aft cabin and soak our mattress which also held the cockpit canvas enclosure and cockpit cushions, which were badly stained and will be replaced. The humid heat made work slow, but we were able to launch on November 29. We picked up a mooring in Prickly Bay which gave us a secure base to fix problems we encountered only after launch: joker valves on both toilets failed and were replaced, the manifold supporting our fresh water system failed and had to be by-passed, the Nikon camera left in deep storage for the summer could not be resurrected, leaving Brian with just a couple of point-and-shoot cameras. We completed our initial grocery provisioning. Thankfully, it was cooler on the water than on land, but was still very warm: the aft cabin where we sleep never got cooler than 84 degrees F.
We started listening to weather broadcasts to find a weather window to make passage from Prickly Bay on the south coast of Grenada to Carriacou, the Grenadian island north of Grenada. On December 13 we made the 40-mile passage. In the wind-shadow of Grenada we had gentle seas and little wind, but as we got to the 12-mile passage between islands, the waves and wind became greater but the current swept us westward making sailing impossible even with ENE wind. We made the mistake of steering close to the island group the Sisters, and home to the underwater (currently inactive) volcano Kick ‘em Jenny. The 100-foot shelf augmented the 5-foot waves to 8 feet and we took some hard slams. Our 30-pound kellet in its lexan holder on the bow jumped out of its holder and sank without a trace. We imagine the fish must have been very surprised as our kellet passed them on its way to the bottom of the sea. The 40-mile passage from Tyrell Bay, Carriacou to Bequia was a beautiful sail. We anchored on the north side of the bay at Port Elizabeth and must have set the anchor well in sand, because we were secure in the 20-30 knot winds that battered us for the next 2 weeks. There were days we could not leave Pilgrim because of the wind and waves. We enjoyed watching the local birds: Brown Boobies, Magnificent Frigate Birds, Royal Terns, Tricoloured Herons, and surprisingly Oystercatchers and Kingfishers. 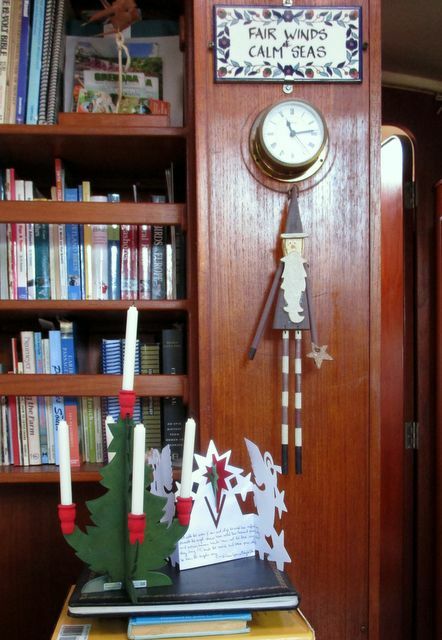 We set out our Christmas tree and decorations, listened to our favorite Christmas music, and had a buffet lunch with other cruisers at Daffodil Marine Services. We enjoyed the local produce from St. Vincent: bananas, dessert figs (baby bananas), pineapples, avocados, tomatoes, tiny, juicy limes. We watched the charter boats come and go despite the high winds, and were grateful we could wait for a good weather window. 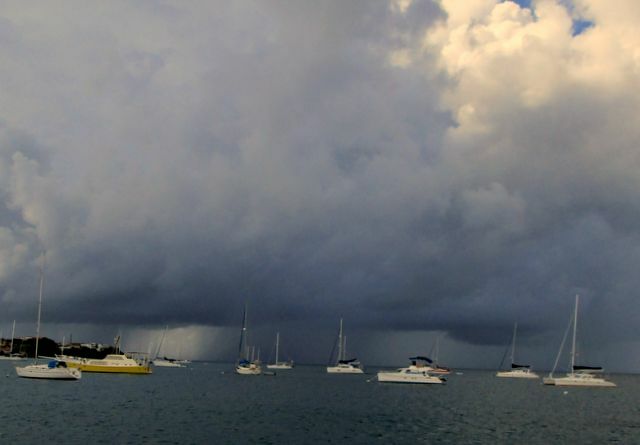 We finally found a weather window to make the overnight passage from Bequia north to St. Vincent and St. Lucia just before New Year’s Eve. The winds were forecast to be East at 15 - 18 knots and the waves were predicted to be down to 5 feet. We left just before sunset so we could see the fishing floats that studded the water around Port Elizabeth. 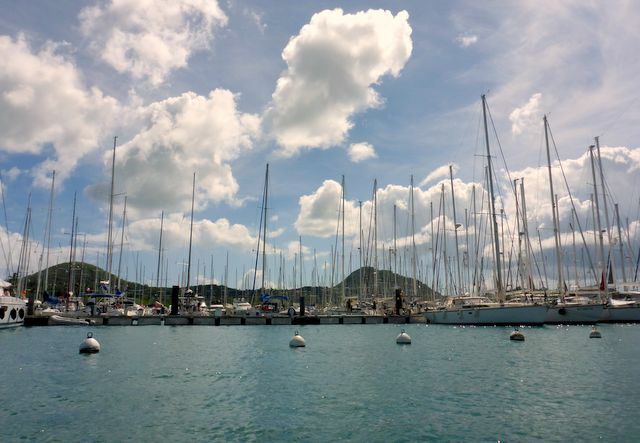 As we cleared Bequia and entered the channel between Bequia and St. Vincent we felt the seas and wind and were able to sail to get to the west side of St. Vincent. The passage started well. However, as we progressed in the lee of St. Vincent, the wind and waves subsided and the motor propelled us. This first overnight passage was dark: no moonlight with the new moon. Around midnight we reached the north tip of St. Vincent. The wind picked up, but so did the west-moving current. In order to make a course of 005 degrees, we needed to steer 030 degrees with ENE wind blowing from 070 degrees. We motor-sailed. The 5-foot waves hitting us broadside were uncomfortable, especially when the tidal current collided with the wind-driven current. One augmented wave hit hard and for a moment we felt we might roll-over. The lee coast of St. Lucia was most welcome. We arrived at Rodney Bay on the NW coast of St. Lucia with the rising sun. Although Brian did not have a fishing line out, we found 5 flying fish on deck as we tidied up. Rodney Bay is a popular and fairly good anchorage for private and charter boats, but there is hardly any city on Rodney Bay. There are several resorts including a large multi-building Sandals establishment. At midnight on New Year’s Eve there was a large fireworks display. It was not as large and elaborate as the Symphony of Fire displays that used to be choreographed with radio-broadcast music in Toronto or Olympic displays, but it was impressive, especially since we were right under the display (there was no exclusion zone as there is for most US and Canadian events). Fortunately no hot / live cinders fell on Pilgrim. St. Lucia has a bad security reputation. We are warned not only to lift our dinghy out of the water for the night, but also to chain it to our boat. We met a cruiser in Bequia whose dinghy was stolen in Rodney Bay when he left it unchained for the night. It is recommended that cruisers lock themselves in their cabins overnight and latch all hatches. Going ashore during the day the boat is also locked. We followed the recommendations and the only problem we had was a decrease in air circulation overnight due to closed hatches. 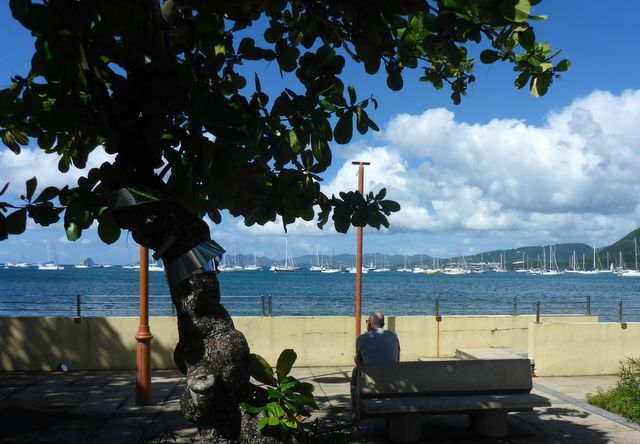 We took the local bus to Castries, the capital city about 10 km from Rodney Bay. The trip to Castries was slow; the road is single lane in each direction and was jammed with vehicles. The trip back to Rodney Bay was even slower. As we approached Rodney Bay the reason became evident. There was a police roadblock. Military in camouflage with machine guns poised on their shoulders augmented the police and pulled over some of the private cars they found suspicious. Back at the marina, no one could tell us anything about the cause of the roadblock. We noticed that the numerous Security Personnel at the local shopping mall carried guns. After we left Rodney Bay we learned that some cruisers leaving the Lagoon found a body floating in the channel and that there had been 10 murders reported in the first week of January on St. Lucia. The tourist pamphlets describe St. Lucia as Paradise. Perhaps for North Americans on the gated resorts who pay $500 USD per night, but for locals there is a different story to tell. Last spring we did not stop at Martinique. The anchorages along the west coast can be uncomfortably rolly with the sea swell, and making the passage along the south coast to Ste. Anne against the prevailing easterlies is slow. However, the passage from Rodney Bay north to Ste. Anne is easy if the wind and seas are moderate. Except for a few moments in a rain squall our passage was easy. 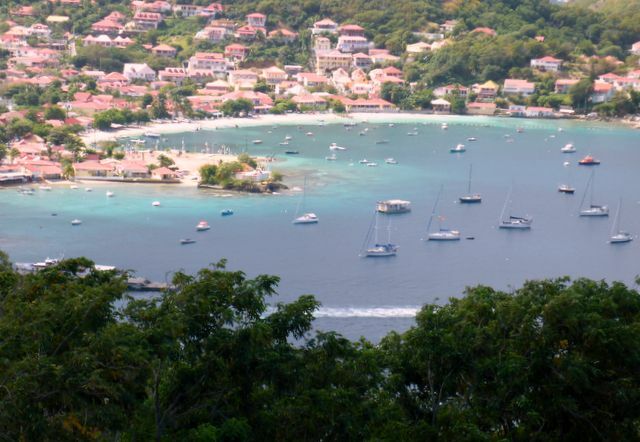 The deep bay, Cul de Sac le Marin, is popular with cruisers. 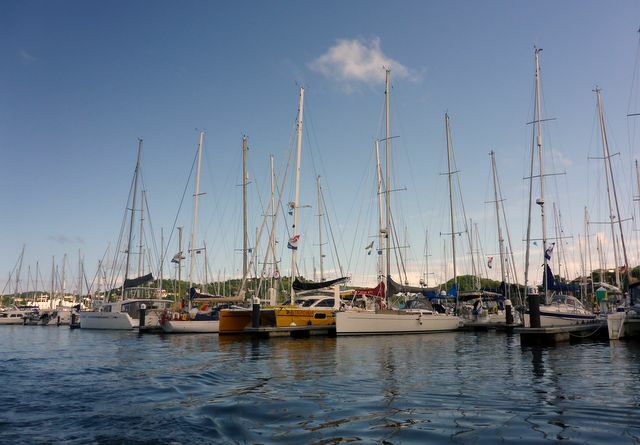 Le Marin has a huge marina with multiple floating docks and Med-mooring facilities. There are also many moorings and anchored boats that seem to be as close together as moored boats. Further out in the bay is the tourist village of Ste. Anne and with more than 100 well-spaced anchored boats. We anchored off Ste. Anne. One of the main attractions for us was the food. Martinique is a French Overseas Department, like Guadeloupe, St. Barts and the French side of St. Martin. Imports, including food, are subsidized by France. Also, Martinique has more arable land for market gardens, thus local fresh fruits and vegetables. Ste. Anne had two convenience-sized grocery stores, a bakery and an open-air market. The cheese, Prosciutto, melon baguettes and bananas were superb. There was little or no fresh meat. We were looking forward to the larger stores in Le Marin, but were disappointed in their selection of produce, meat and even coffee beans. The dinghy dock near one of the stores was more congested than many North American mall parking lots the week before Christmas. Since Martinique’s main industry is tourism we thought speaking English would not be a problem, but there were few people who felt comfortable speaking English to us. Even in the harbour-side main restaurant communicating in English was a problem. We decided to move to Anse Chaudiere near Petite Anse d’Arlet on January 19. The crystal-clear water off Ste. Anne seemed to be laden with nutrients. Our waterline developed a skirt of long, green slimy growth that we scrubbed off daily, and the propeller looked like it had grown hair. We passed Diamond Rock on our passage. This is a pinnacle island about 5 miles off the Martinique coastline. In the 18th century, when the British held Pigeon Point on Rodney Bay, they decided to claim Diamond Rock as a HMS (his majesty’s ship). There is no landing spot. The cliffs rise out of deep water. Yet the British managed to haul cannons to the peak and station a battalion of soldiers that caused havoc for the French fleet for a few years. The water in Anse Chaudiere was beautiful and the sunsets spectacular, although they did not provide a green flash. The little town of Petite Anse d’Arlet was a charming tourist village without much to offer the cruiser except a place to check out of Martinique. We made the 90-mile passage up the coast of Martinique in daylight with a fishing line out. No fish were interested. The passage between Martinique and Dominica provided enough wind to allow us to sail, but then the lee of Dominica blanketed the wind. The last 10 miles of the trip between Dominica and Les Saintes gave us a final opportunity to sail. However, we arrived in Les Saintes before moonrise and well before sunrise. We anchored on the east side the Terre de Haut to catch a few winks of sleep before we could enter the harbour and look for a mooring. There were no moorings behind our favourite mooring field west of Ilet a Cabrit, but we were directed to mooring #48 right in front of the ferry dock and were grateful for secure mooring within range of a WI-FI signal. The week of Donald Trump’s inauguration and the flood of executive orders we did not have any ability to get news and we were starved. Les Saints is part of Guadeloupe, and therefore an excellent source for fresh produce, cheese, bread and fish. Unlike Martinique, most people can and will speak English if your French is too lame to use. 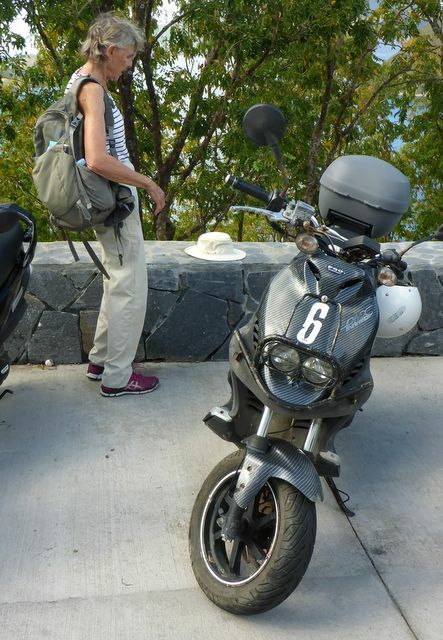 This is one of our favourite ports in the Leeward Islands and we enjoyed walks, tourist shopping, and making our way to more distant locations on a hired scooter.